You should always keep an eye on your competitors based on their Visibility as part of your ongoing market monitoring. With the SEO-module and the dashboards in the Toolbox you have all the necessary tools, at your fingertips. In this tutorial, you will learn how to avoid typical surprises and how to make changes within your competitors Visibility transparent. Which values should be in a dashboard? You have already identified your competitors by doing a competitor analysis. Now, depending on the size of your projects, you can create a dashboard for all of your competitors together, or one dashboard per competitor. This tutorial will show you how a dashboard for a competitor may look like. You can, of course, also create a dashboard for your own websites with this information. That way you will always be informed if a part of your website gains or loses Visibility. It is important to keep in mind that dashboards are not supposed to show the cause of an improvement or a decline. It should tell you that there is a change, and if so, where. Let us say that your competitor is Rewe.de and you are responsible for Edeka.de – both of them large grocery stores in Germany. 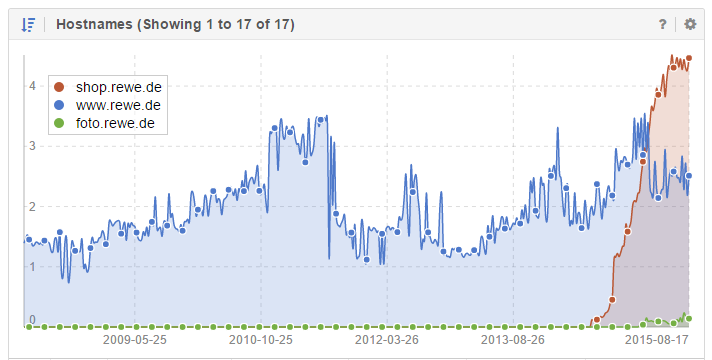 You want to be informed of all your competitor’s ranking changes. Additionally, you want to know when new pages are added to the website and if those might already be nurturing good rankings. So now, we set up a dashboard based on these assumptions. 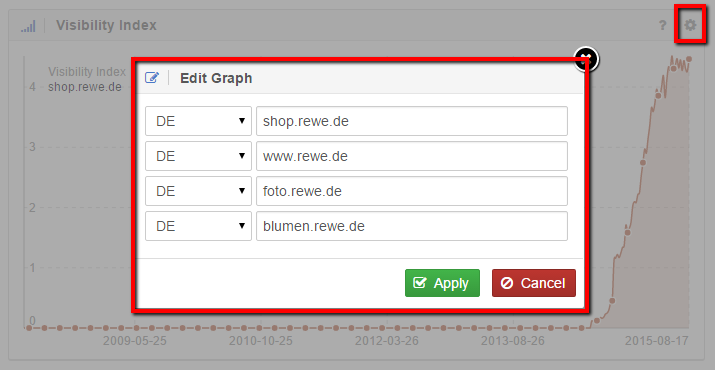 First of all, we add the general Visibility for the entire domain rewe.de (https://de.sistrix.com/rewe.de), including all host names and directories as a chart to our new dashboard. By doing so, we create the dashboard, in the first place. For the second step, you have to analyse if your competitor is using multiple subdomains. 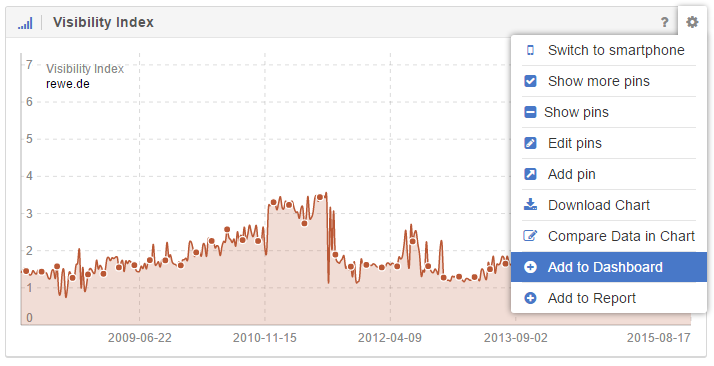 You can easily check this out in the SEO-Module by going to “Hostnames” (https://de.sistrix.com/rewe.de/seo/hosts). There, we write down the important subdomains. These hostnames are important and compete for the same topics as our own domain (edeka.de). Now we open one of these hostnames directly in the toolbox. To do so, simply enter the hostname into the searchbar – for example https://de.sistrix.com/host/shop.rewe.de. Afterwards, click on the cogwheel in the top right-hand corner of the Visibility Index chart to open the chart-menu and choose “Compare Data in chart”. This will open a small popup where you are able to type-in additional subdomains. Now, just add this chart to the dashboard, by going to the box settings – below the cogwheel in the top right – and clicking on “Add to Dashboard”. Our next step is adding directories of important hostnames. You have to keep an overview if something is happening in the shop directory on rewe.de, but you also want to know if anything important happened to the regular www.rewe.de. This, too, can easy be realised in the same dashboard. 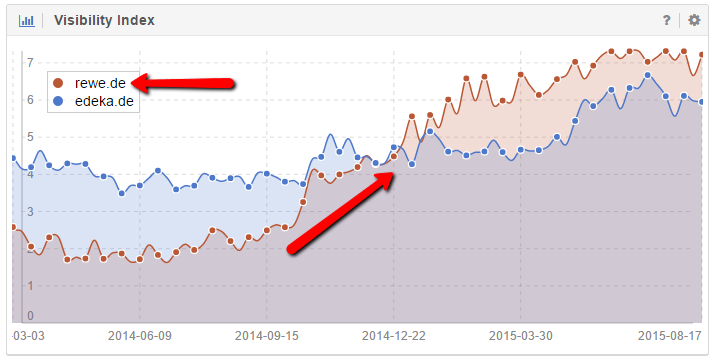 We will now create an additional chart for both subdomains with the most important directories. Type the hostname shop.rewe.de into the searchbar for the SISTRIX Toolbox and go to “Directories” in the left-hand navigation of the SEO-Module – https://de.sistrix.com/host/shop.rewe.de/seo/directories. We now add the chart, including the table, to our dashboard and give it a self-explanatory name. Using this method, you can now create charts for all directories on the important hostnames. In the version you have now, the dashboard is already very helpful. For one, it saves you a lot of time and it gives you a quick overview of how directories and subdomains are doing. In addition, it informs you of changes on these different levels. Compared to a dashboard full of numbers, charts allow you to visualise changes at greater speed. You want to take your dashboard one step further? No problem. When you open the dashboard for rewe.de, you will see the very noticeable history for the directory “/getraenke/” (drinks) on “shop.rewe.de”. You can now type this directory into the Toolbox searchbar and, once again, look at the additional directories for this level – https://de.sistrix.com/path/”https://shop.rewe.de/getraenke/”/seo/directories. Now, you can see in detail which directories on the “Getränke” (drinks) level in the REWE shop have a positive or negative impact on the overall directory. While you are able to also add these deeper level directories to your dashboard, please remember that dashboards are only supposed to give you a regular overview. They are supposed to show you at first glance if any changes took place or not. You can do a deep evaluation within the different modules of the SISTRIX Toolbox. If you want to see the rankings for /whisky/, for example, you would switch to “Keywords” in the SEO Module after typing the directory into the searchbar. Are you content with boxes showing percentage values instead of entire charts? 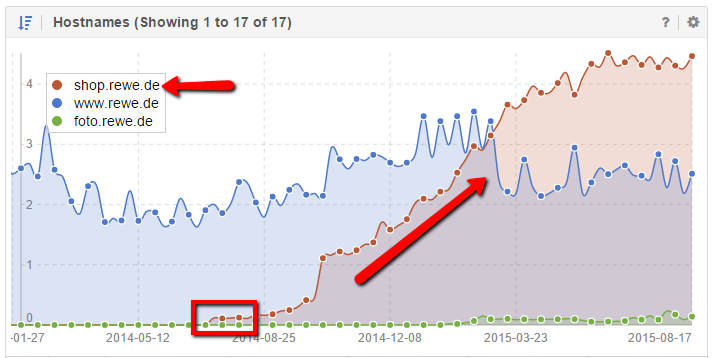 In that case, you can just add the first box in the SEO-Module for every hostname and directory to your dashboard. Your dashboard will have a very minimalistic look, but may already suit your purpose. This dashboard would not show you any history, though. If you want, you can also always combine both versions. Just because something gets shared in social networks does not mean that the page gets any notice in Google. That is why it is important for you to monitor the shared URLs of your competitors. That way, you will often see new content before it even has a relevant ranking on Google. This gives you the ability to react early on. To get the newest URLs for the entire project of a competitor, all you need to do is evaluate the domain in the Toolbox. You just type in “rewe.de” in the searchbar and navigate to “New URLs” in the Social-Module. There, you will find a table with all the current URLs that are being shared over social networks. Just add this table to your dashboard. This way of using dashboards gives you a good overview over the most important movements when it comes to your competitors. You just have to make sure that you are monitoring the important parts of your competitors websites. Then it is up to you to decide if you would like to have charts in your dashboard, or if you are fine with only boxes showing the change in percentages – of course, you can always combine both. The following case might have ended differently with a dashboard. Rewe surprises Edeka – could this have been recognised sooner? 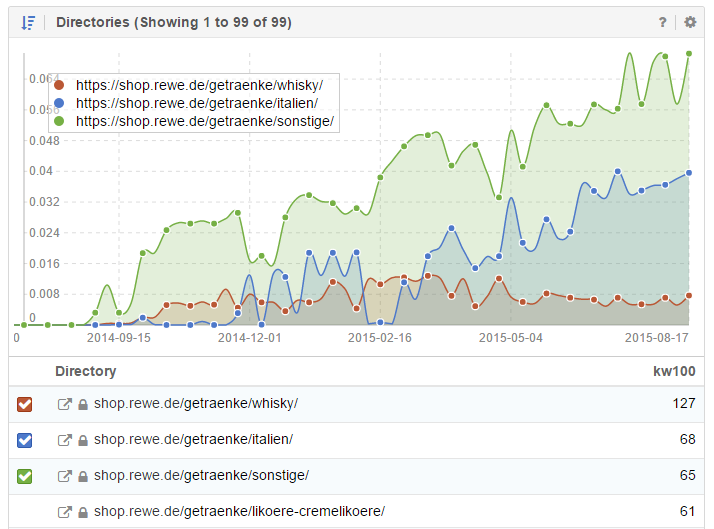 REWE overtook Edeka in terms of Visibility. This could have already been recognised 6 months earlier. 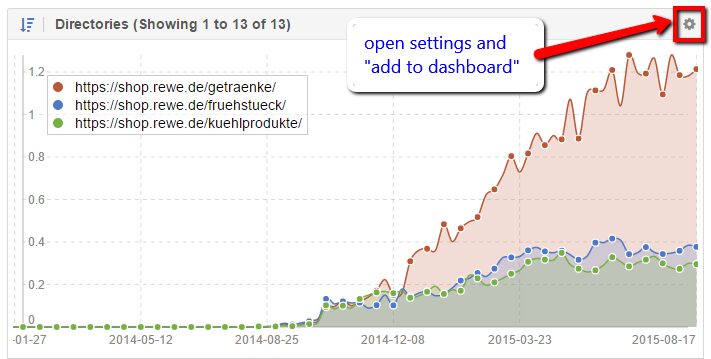 With a dashboard, such as the one we described in this tutorial, Edeka could have already spotted the new shop directory on REWE on the 14th of June, 2014. That is enough time to come up with a new strategy on how to compete with this new approach of your competitor. 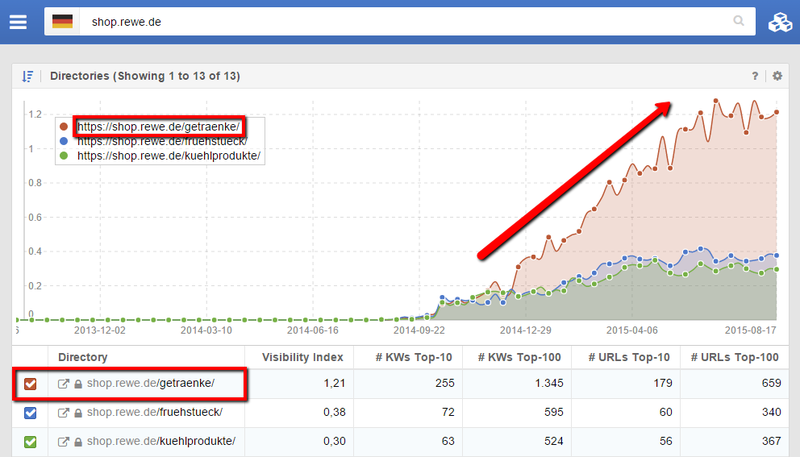 On the 29th of December 2014, REWE finally passed Edeka in terms of Visibility. You can prevent such a “surprise”. Use the dashboard feature of the SISTRIX Toolbox to keep an eye on the market.